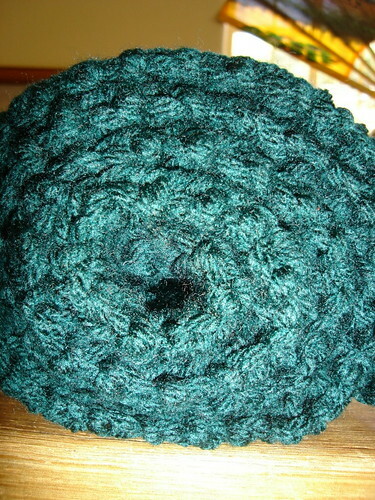 I finally got the ends sewn in on my Scarf for Africa. 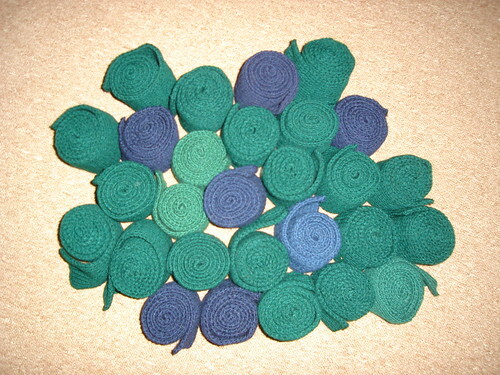 I’m going to deliver all the ones that have arrived so far to Bronwyn tomorrow. This is what 48 scarves looks like. Most of these came from Karol Ann, Karol Ann’s mum and mother-in-law. Karol Ann tells me that her mother-in-law has already started knitting for next year, so I guess we are doing this again! 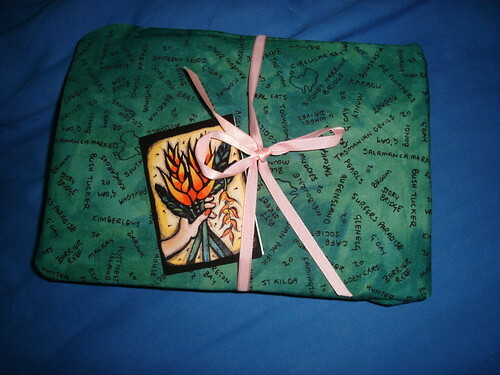 Vikki also sent 6 scarves, there are several from Donia in there as well and one from Christina. Thank you so much!!! The kids are going to be so happy and warm. If your scarf is still on its way to me that’s OK. I’ll be seeing Bronwyn before I go and I know that she will be going out to the schools on a regular basis during the winter, so they will still be delivered. I have my water back. Which is a very good thing because my company has a big launch party tonight in Cape Town for its new name. I’m glad I won’t have to shower in a bucket before the big event. Tomorrow, pictures of thrifting finds and a sewing Finished Object. Gorgeous Girl has a new quilt. I finally finished sewing the binding on last night. 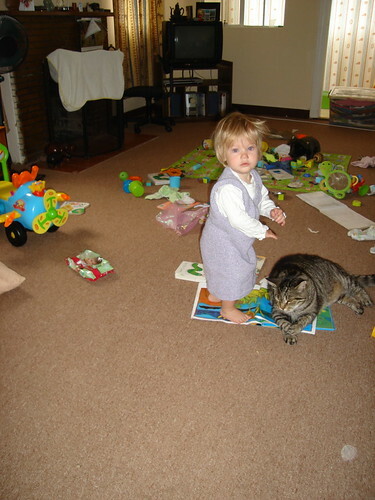 I spread it out on the floor for Gorgeous Girl to find in the morning. I think it’s a hit. The colours are truer in the pictures with Gorgeous Girl. Another scarf arrived this week from Vikki. She was also very naughty and included some fabulous handmade stitch markers. I will post a picture of them in my next post. Today was weigh in day at my gym. I’ve had 13 sessions there. The only place I’ve lost is 5 cms from my hips (that’s about 2 inches for you folk still using imperial). The chest area actually gained 4 cm! And body fat has reduced by half a percent. Not as good as I’d hoped, but I do feel fitter walking around our very steep and hilly campus, so that’s a good thing. I’ve got another few weeks to keep working before the next round of measurements. Sometimes it’s hard living in a country that isn’t your own. Sometimes it’s hard because life here is different to what you are used to and you long to slip back into that which is familiar and comfortable. Where you don’t need to worry if you are making a cultural faux pas or saying the wrong thing. Sometimes it’s hard because of what is happening in your home country. This last week has been one of those times. When I log on to my computer my home page is the Australian Broadcasting Corporation’s news page. I have shed many tears this week watching fire tear through my beloved country. Logically I know that there is nothing I could do if I was there, but my heart is heavy nonetheless. Gorgeous Man and I spent 2 years living in country Victoria and one year in Melbourne and our familiarity with the area has made this all the more difficult to see. There were some bright moments this week though. The first of our Scarves For Africa project has arrived at my house. 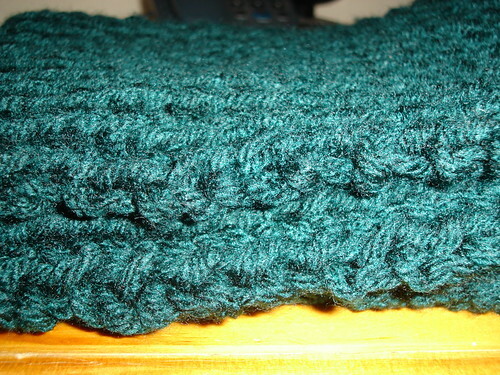 This lovely bottle green beauty comes from Vikki, a South African knitter I ‘met’ on Ravelry. She may also have included some delicious hot chocolate which I would never buy for myself because it’s so delicious and I have no self control it’s too decadent to have in the cupboard. But since there’s no longer any evidence, you’ll never know. 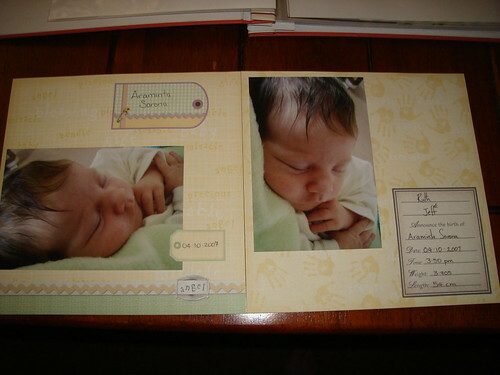 A few weeks ago I won a contest on Leah’s blog, She has the Logic of a Puggle. Her wonderful prize arrived yesterday. Given my current feelings of homesickness. I have to confess that I got a little teary eyed when I opened up the parcel and saw this fabric with little Australias and the names of some of my favourite Australian places printed on it. The fabric for the doll pattern is currently sitting on the table waiting for Gorgeous Girl to have a nap so that I can cut it out and make a few. I got sick of Gorgeous Girl’s toys being scattered from one end of the living room to the other, so I visited Plastics 4 Africa (that’s the actual shop name) and bought a small washing basket that she can easily reach into. We are now working on putting her toys away before getting new things to play with. Right now she is packing up her beads so that she can play with her Tupperware shape ball. She’s grasped the concept of packing away well, as long as we tell her. We aren’t quite at the stage of packing up independently yet. This week Gorgeous Girl started threading plastic beads onto laces and that has become a favourite toy. Gorgeous Girl has been difficult (to say the least) this week and it took me until Friday to actually find a moment to take pictures. and tried two kinds of green. The we added purple to the bowl. I wrapped the big coil of purple and white into a ball and let the dye penetrate, then because it wasn’t going all the way to the middle I wound some off to expose new parts of the ball to the dye. I was really pleased with this one. It turned out exactly as I pirctured it in my head. Now to see if it will spin up the same way 🙂 I’m hoping to spin this lace weight and make a shawl out of it. After the green, but before adding the purple dye we put some yarn into the pot to soak up any excess dye in the water (we didn’t change water between colours). 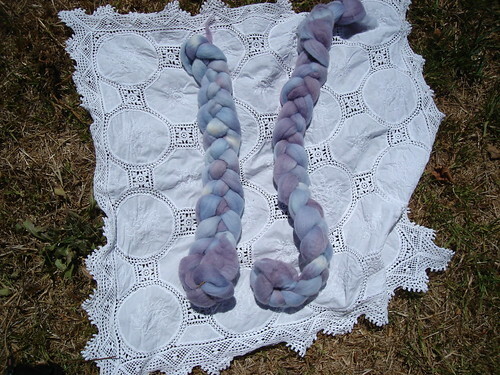 These were also used to soak up the extra dye after the purple as well. I was surprised at how well they turned out. I’m calling them my happy accidents. 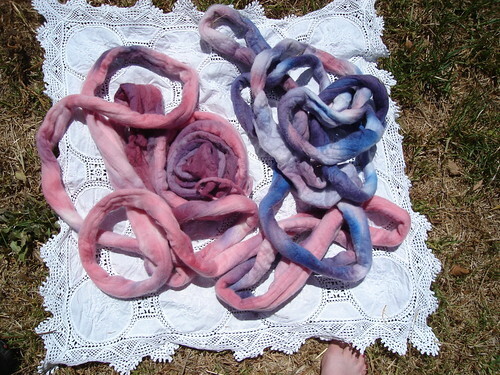 Lastly we took a very big ball of fleece and put it in the purple pot (with the green fleece above) when the dye was exhausted, we poured red directly onto the ball and squished it down, then we added bright blue (to get a different shade of purple). Unwinding bits of the ball helped to spread the colours. 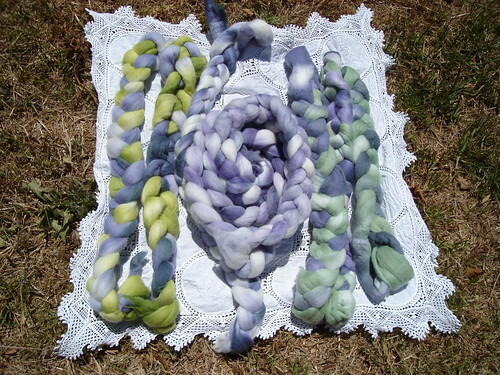 I don’t have a spinnng plan for this yet, so it’s going to marinate in the stash. 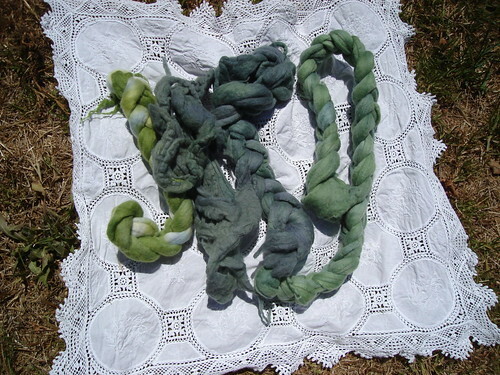 Then, so that no dye would go to waste we threw some more fleece into the pot to soak up any last dye. The red and the blue took up at different rates and we ended up with this. 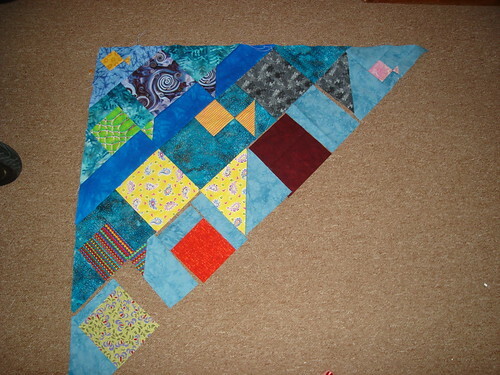 Since so many of you commented that you would like to see a picture of the quilt in progress. 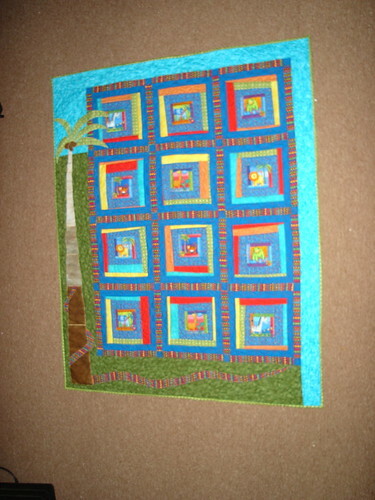 I present for your viewing pleasure Fish Quilt: Row 6. Because this is done with tricky pieces and templates and the pattern doesn’t label the pieces beyond the colours of the fish, I’ve been laying it out on the floor to make sure that I’m sewing the right bits together. I’m so glad I did, because in this row it seems that one of the blue pieces has been omitted from the cutting instructions. I’m going to sew from the top and the bottom and then try to work out how wide I need to cut to make it fit. The Scarves for Africa Project is coming along well. We have ten (!!!) from Karol-Ann, and at least one from Rebecca so far. I’m still working on mine, I’m slow because it’s my in the car knitting. If you are knitting a scarf (or three) can you leave me a comment on where you are up to and I’ll do a shout-out post. We want to start distributing them by June or July at the latest. Actually, Kerin asked for it. 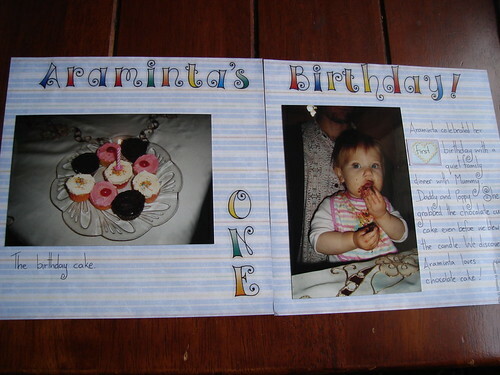 She wanted to see the scrapbook pages that I did for Gorgeous Girl. 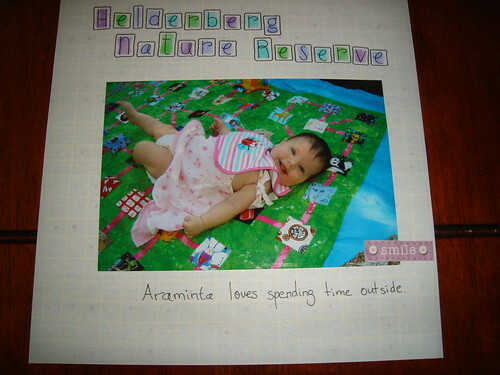 Since Kerin is the reason I started scrapbooking in the first place (she tempted enabled me by mailing me scrapping supplies), I thought I should oblige. Knitting content at the bottom of the post – feel free to scroll down. I turned this into a double page spread. OK Kerin, now fair’s fair, and I want to see some of the pages you’ve done using the photos of Gorgeous Girl that I sent you. I am down to two knitted projects on the needles. 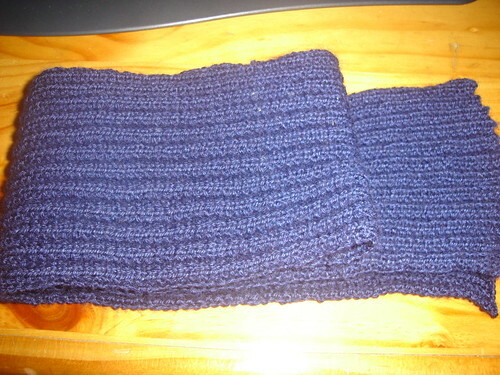 A scarf for my Scarves for Africa project (up to three scarves from bloggers and bloggers mum’s). That’s my take along project for car knitting and waiting etc. Then I decided to try my hand at lace. I have been searching for the perfect pattern for this silk that Gorgeous Man brought back from the USA in 2006. Finally think I’ve found it in Knitty’s Juno Regina. I hope the colour isn’t too ‘busy’ for the pattern. First attempt at knittng from a chart. It’s going better than I thought it would. Only had to pull back once and I was very impressed with myself to be able to TINK back to a usable/identifiable row. I got an early Christmas present (from myself), but it’s so exciting it deserves a post all of it’s own. There has been another finish here at Ruth’s Place. 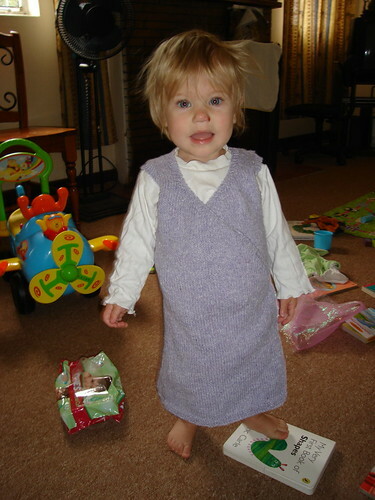 This little knitted dress was a pattern from Tiny Happy. It’s a bit long for her, so she looks a little monk-like in her cassock 🙂 But it’s sweet, and by the time it’s cool enough to need an overtunic, it will fit nicely. Yes, she needs a hair-cut. The scrape on her nose is from a tumble she had. 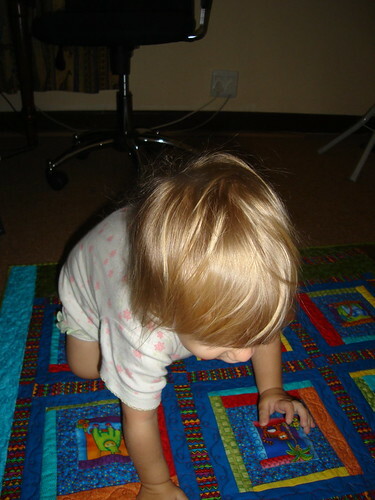 Our care for Gorgeous Girl (while I work) has fallen through – the girl we were employing has gone back to Johannesburg for the semester break, this means that Gorgeous Girl is amusing herself while Mummy works on the computer, hence the disaster of a living room you can see in the pictures. 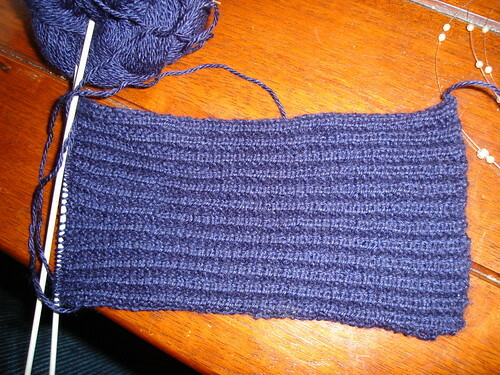 I’ve begun knitting on a scarf for my Scarves for Africa project. I’ve had plenty of car knitting time over the last few days and I needed something simple. We had our company end of year function in Cape Town (will blog about that in a different post) so knitted then, and Gorgeous Man, Gorgeous Girl and I went away for the weekend (will also blog about that in a different post as well). for charity knitting. 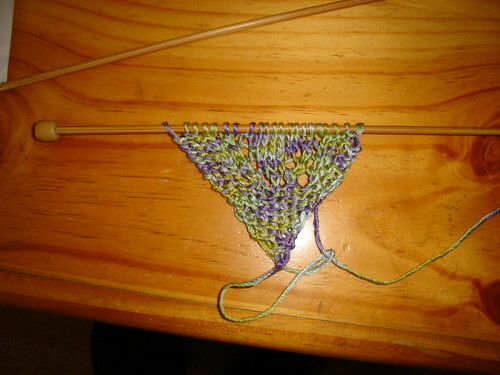 In hindsight I should have doubled the yarn…3mm needles is going to take me a long time, but it’s a joy to knit with. I would be remiss in mentioning the Scarves for Africa project without letting you know that the first scarf of the project has been finished. 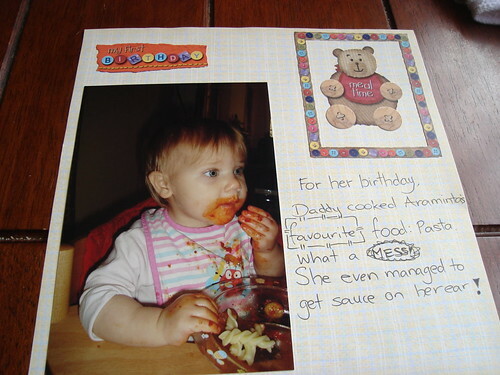 You can go and see Rebecca’s blog here for a picture. It’s her own design too. Very nice!! I’m officially on holiday for the rest of today and tomorrow. 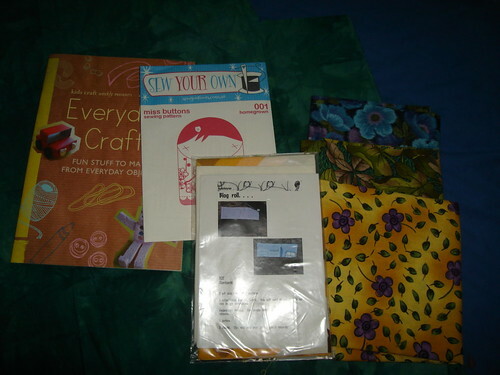 So hopefully I’ll get caught up on my blog reading, and posting, and some knitting and sewing. 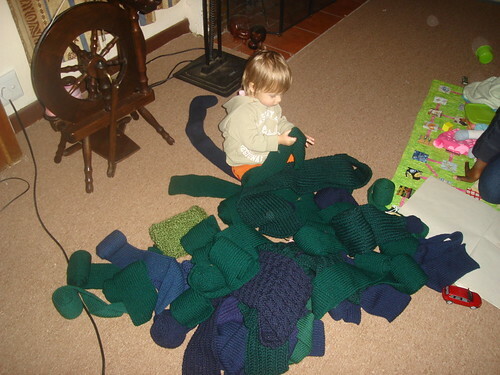 Hmm, how much can I cram into the next 48 hours…?